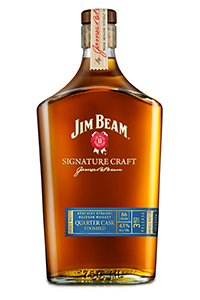 June 25, 2014 – Jim Beam is putting more emphasis on its Signature Craft line of premium Bourbons with plans to roll out six new expressions over the next year in what’s being called the Harvest Bourbon Collection. 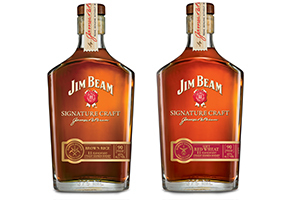 The series will begin in September with the launch of Jim Beam Signature Craft Soft Red Wheat Bourbon and Signature Craft Brown Rice Bourbon. Both whiskies use grains not traditionally used in Jim Beam’s regular Bourbons, and represent some of the experimentation that has been underway for many years at the Jim Beam Distillery in Clermont, Kentucky. In fact, brown rice was used along with triticale in the rare Jim Beam Signature six-grain Bourbon that was available in travel retail during 2010. Soft red wheat is the flavoring grain used in Maker’s Mark Bourbon. The initial releases will be followed in 2015 by Harvest Bourbon Collection whiskies featuring triticale, rolled oats, six-row barley, and high-rye content mashbills. Both initial releases will be bottled at 45% ABV and available in limited amounts for a recommended retail price of $49.99 USD. Quarter Cask has been bottled at 43% ABV, and will be available at whisky specialist retailers for a recommended retail price of $39.99 USD. Tasting notes will be available soon at WhiskyCast.com. Beam Suntory has not announced export plans for the three new whiskies at this time. This story will be updated as more details become available.